Virginia Woolf famously said that "of all the great writers [Jane Austen] is the most difficult to catch in the act of greatness." What she meant is that Austen doesn't have stand-alone passages of great brilliance like Hamlet's soliloquy or long, beautiful, atmospheric descriptions like Dickens's famous passage on the London fog. Austen's greatness is so tightly woven into the entire fabric of her works that it's impossible to pull on one thread and observe it. Persuasion is the story of Anne Elliot, a young woman who was persuaded by an older friend to break her engagement with the man she loved, Captain Wentworth, because of his lower social standing and lack of money. For eight years she has regretted the loss of that love and slowly withered, losing her "bloom" of youth and beauty. Now Wentworth is back in her social circle, but this time rich and well-regarded, and Anne is compelled to watch the young women around her swoon over him and be courted in return. 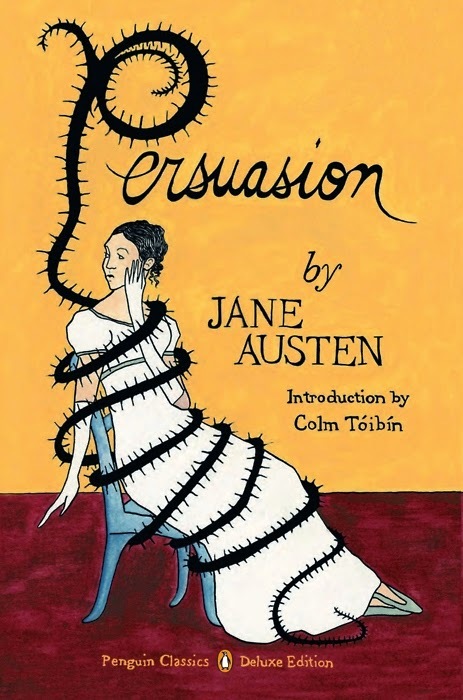 Persuasion was the last book that Austen wrote before she died at age 42. Many critics love it for its more melancholy, dark tone, but I've always found this view overstated. The 1995 film adaptation emphasizes Anne's homeliness and pathetic situation in life, but the novel itself makes Anne neither homely nor pathetic. Within the first quarter of the novel she has regained her "bloom" and she has friends who like and esteem her (though the members of her family are not among them). She's not someone in crisis; she's someone who has come to terms with her decisions and her losses. Unlike the heroines of Pride and Prejudice and Emma, she doesn't need to be transformed through the course of the novel; she's already been transformed—she just needs a second chance to show it. Virginia Woolf makes the case that Persuasion is quite flawed but intriguing because it signals a transition to a new stage in her writing—a stage that we never got to see because she died shortly after Persuasion was published. Woolf's essay on Austen is here and is devastatingly poignant about what we lost because of Austen's early death. What remains, though, is great. Jane Austen pulled the English novel back from the excesses of romantic and gothic melodrama and made it sharp and biting. Most important, according to scholars like John Mullan (a summary of whose excellent book on Austen can be found here), is her invention of an entirely new type of narration: indirect free speech. "It was raining outside, so she decided not to go out because she didn't want to ruin her hair." "It's raining outside. I'd better stay inside; Mother would be so upset if I showed up with my hair in disarray." "It was raining outside, so she stayed inside. Obviously one cannot risk appearing in public with damp hair, especially if there is a rather eligible young man in attendance." What's cool about indirect free speech is that it opens the way for irony. The narrator, supposedly omniscient and impartial, is relating the point of view of the character (a vain young woman) as if it were a universal truth while actually making obvious the narrator's distance from it and (usually) disapproval of it. This is the whole tenor of modern, informal communication, isn't it? Once at work I overheard a young guy talking to a young woman (one he obviously liked) about music, specifically some sub-sub-genre that he was into . . . "neo-soul bluegrass" or "Finnish pop electronica" or something. As he's blathering on, she is saying "Sure, sure . . . " with the straightest face possible but unmistakable sarcasm for anyone watching from the outside. The subtext: I'm speaking as if your knowledge and enthusiasm about this subgenre are universal, like we all listen to it, but really I'm emphasizing your singularity and my distance from you." Austen scholars assert that Austen was the first novelist to employ this technique. If so, this is rather huge. Did Jane Austen invent modern irony?